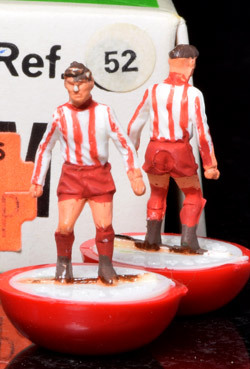 Generic ref 1 in the numbered box which has tape marks and Bristol City /4 written on the lid. 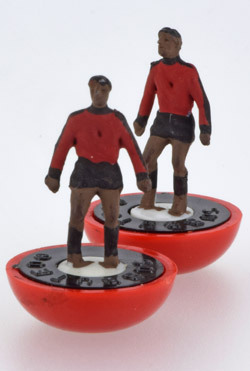 The team has some play wear, one has had his boots missed by the painter and Subbuteo sticky numbers have been applied to the backs. A larger picture of the team is available by clicking on the image left. 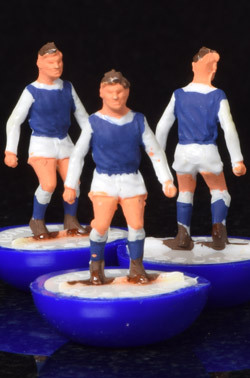 Sheffield Wednesday ref 17 in a really nice near mint condition. 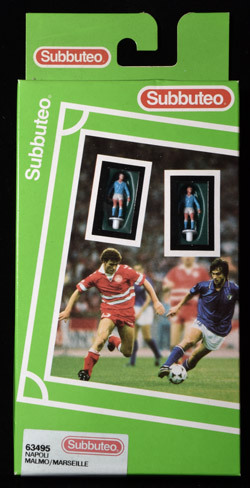 The box is also good with just a price label removal tear on the box end and a home made replacement number 17 sticker added by the previous collector. Excellent condition with just the slightest of wear, the numbered box is also excellent with Bayern Munish written on the box end along with price sticker. 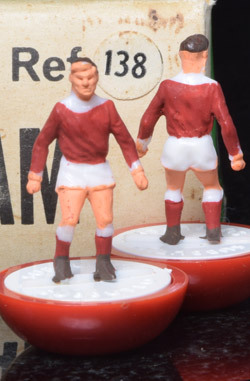 Near mint team, one figure tilts slightly back and has cracking to the ankles but not broken or repaired. The box is numbered but slightly aged, the inner tray has ink splash marks. Haiti ref 175 on the Hybrids figure. In excellent condition. The box is not the portuguese printed one that probably would have come with this team originally and is a modern replica with hand written ref sticker.